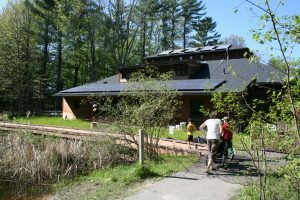 David Catlin Consulting – Should Your Nature Center Run a Preschool? When I work on projects involving nature-based preschools, I team up with Rachel Larimore. Rachel is the author of Establishing a Nature-Based Preschool, and (like me) would like to see a lot more of them. Well, no, we haven’t. I guess the logic of nature centers opening and operating nature-based preschools has always seemed self-evident, at least to us. But maybe it isn’t so obvious to everyone else. If you’re serious about forging a deep connection between children and the natural world, the earlier you start, the better. Children’s emotional responses to nature—which form the foundation of their future learning and behavior—develop in the first few years of life. There is no better time to engage parents (and grandparents!) as supporters of your center than when their children (and grandchildren!) are young. By the time the kids are in junior high, parents may be just dropping them off at ice-skating lessons on the way to Home Depot. At preschool age, they dote on every finger-painting. Nature-based preschools are the intake-portal for lifetime family involvement. For nonprofit centers, nature-based preschools are one of the few activities that have the potential to be financially self-sustaining. So, we’ve said it: Nature centers belong in the nature-based preschool business. If you want help getting started, give us a call. By way of introduction, I am a retired educator of 40 years (HS & College). My fields were Social Studies and Service Learning/Volunteerism. During this time serving as Chair and consultant/evaluator. For the past 17 years, I have served on the BOD at HWR, presently in the capacity of Chairman. Our directors are presently in the midst of investigating the potential of creating a 4-K Forest School centered on Wisconsin’s Environmental Education platform. As head of the Education/Forest School Committee, I am seeking guidance for our charge. We are open at this point having met only with an architect to gain some very cursory insights. I have as well visited Rachel’s site and ordered her book which is coming tomorrow. Providing my weekend read. Look forward to hearing from you and the potentials of what you may have to offer us in moving forward.